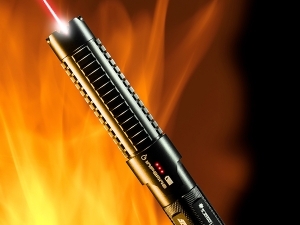 Forged in the fires of a living star, the Inferno is the world's most powerful handheld red laser, with a beam so intense it will bring light to even the darkest reaches of our Universe. The Inferno paved the way for the iconic S3 design - crafted from aircraft grade aluminum, it is virtually indestructible and undeniably larger-than-life. 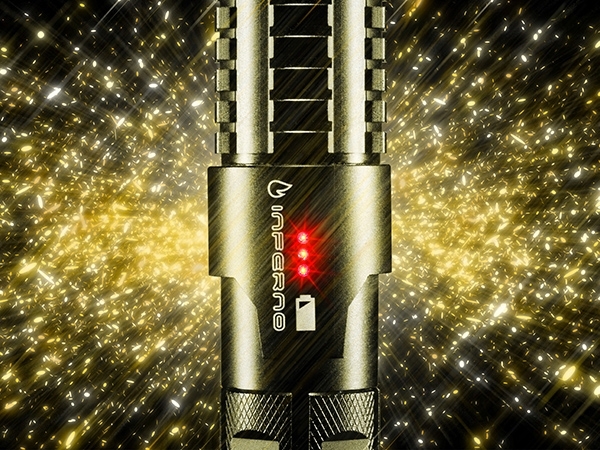 Our engineering ensures that the beam of your Inferno never fades; it maintains the same powerful beam throughout its battery life, never flickering or waning. It's a steadfast companion that never lets you down. 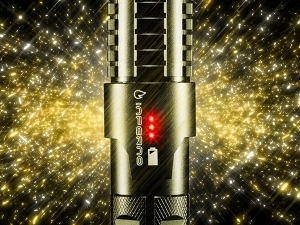 With 9 unique operating modes including Strobe, Constant Wave, SOS, Beacon, Tactical and more, every one of our customers has found unique and practical ways to channel their laser's power. As the saying goes, with great power comes great responsibility. These powerful devices are not toys and are for adult use only, so we've built in cipher-locked SmartSwitch technology to give you full control over who can access your laser. Each Inferno laser comes equipped with a pair of LaserShades, tactical holster, Panasonic battery and charger. We guarantee delivery to every country in the world (except US, CA, AU, CH, and NZ) or your money back. We guarantee your laser will be free from defects for a full year from the date of receipt. We guarantee a 30-day money back return policy. The Expanded Lens Kit includes 4 lenses with various effects. Radial, Flare, Grid and Spiral lenses are included. 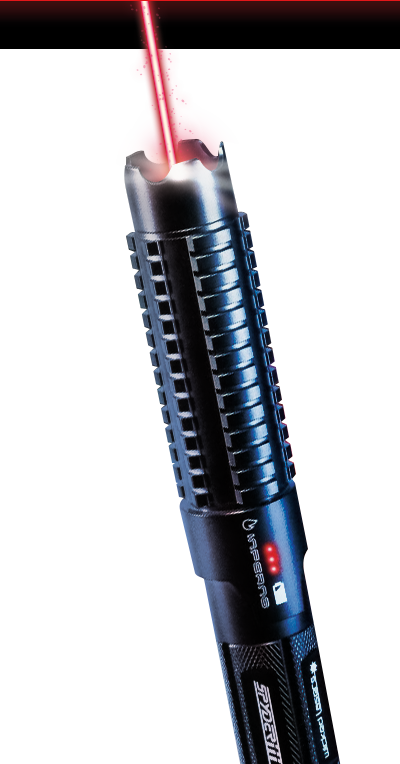 With a hilt of aircraft grade aluminum and a made-in-USA polycarbonate tube, the LaserSaber is strong, highly durable, and fully capable of harnessing the world's most powerful lasers. S3 laser not included. Crafted out of lightweight polycarbonate, the LaserShades takes into consideration the factors of laser hazards while still providing style and comfort. The FDA is the United States Department of Health and Human Services. FDA imports use accession numbers to confirm that a manufacturer has followed the reporting requirements for the product being imported. The materials that make up the physical casing of the laser. The outer casing also serves as a heat sink for the laser module inside. The final scratch-resistant finish applied to the laser casing. Visible light has a wavelength range of 400-700 nanometers (nm). Between lasers of equal output power (in mW), lasers closest to the peak visibility wavelength of 555nm will have more range and brightness than other wavelengths of laser light. Green lasers (532nm) are closest to the peak visibility wavelength (555nm), and therefore brighter than red, blue, and purple lasers. 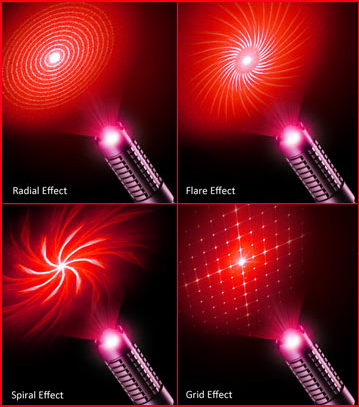 A laser's wavelength and power are two of the most important factors in choosing a laser. Please click here to learn about how different wavelengths correspond with relative brightness. In a laser with cylindrical symmetry, the transverse mode patterns are described by a combination of a Gaussian beam profile with a Laguerre polynomial. The modes are denoted TEMpl where p and l are integers labeling the radial and angular mode orders, respectively. The maximum power level of the laser beam measured in milliwatts (mW). When choosing a laser a higher output power is brighter than a lower output power. For example, a 650nM @ 5mW laser is brighter than a 650nM @ 1mW laser. The minimum power level of the laser beam measured in milliwatts (mW). When choosing a laser a higher output power is brighter than a lower output power. For example, a 650nM @ 5mW laser is brighter than a 650nM @ 1mW laser. A measure of how fast the beam expands as the distance from the source increases. The divergence is measured in milliradians (mrad). A low beam divergence is useful for applications like pointing or free-space optical communications. The width of the laser beam @ aperture measured in millimeters. The Nominal Ocular Hazard Distance (NOHD) is the distance that a laser beam does not cause immediate or long term damage to a person. Calculated based on a 0.25 second accidental (unaided eye) exposure. The maximum distance (in meters) at which the laser will produce 0.25 Lux of light. It's the standard that flashlights are measured against. Indicates whether or not laser protective eyewear is needed, and the necessary O.D. (optical density) of the eyewear for the laser wavelength being used. The indicated O.D. is the minimum O.D. sufficient to protect the user against a momentary intrabeam or specular reflection exposure. The consumption of energy in the form of electricity. The average power consumption of an incandescent night light is 4W. The source by which the laser is powered. The average amount of time the battery can last on a single charge. The switches that must be engaged to turn the laser on. The available laser beam modes once the laser is activated. The time cycle of which the laser can be active without causing damage to the laser module. The average expected lifetime that the laser module can be in active use. The time period for which any damaged or dysfunctional laser resulting from manufacturer's defects or workmanship will be replaced with a new product of the same model. Any attempted disassembly by a user will void the product warranty and may irreparably damage the product. We warrant all laser products sold on www.wickedlasers.com to be free of defects in material and workmanship. 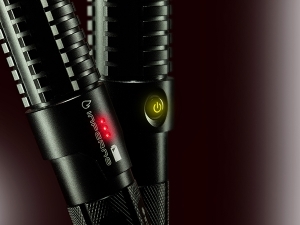 9 unique modes including Strobe Mode, Constant Wave, SOS, Beacon, Tactical and more. Includes pair of LaserShades safety goggles, holster, rechargeable battery and battery charger. 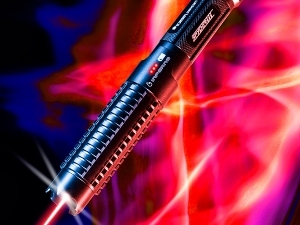 Download the Inferno 3 User Manual for detailed laser usage.